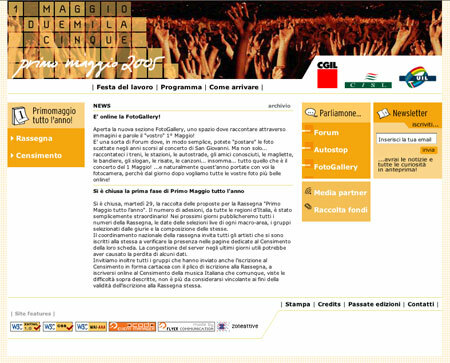 Design and construction of the website for concert / event that is held every year in Piazza San Giovanni in Rome. The site offers information and advances on the event, along with interactive services made available to the users to interact with each other and organize themselves in order to attend the concert. It was also a means of organization and management of ‘May Day all year’, the national festival dedicated to Italian music emerging and independent. The technical design of the site has given priority to road accessibility, to allow the widest possible dissemination and usability of content. The site complies with W3C standards and has obtained the certificate for the second level of accessibility (AA). All content is managed independently by the staff of the May through Ecode, content management system developed by Flyer Communication.